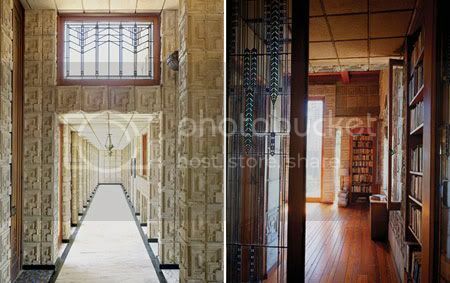 A triumph of his California-inspired style, the Ennis House is the largest and boldest execution of Wright's iconic textile-block designs. The Mayan-inspired house is one of the first residences constructed from concrete block. This method of construction, favored by the Wright, features 16 inch cast concrete blocks that are stacked, without visible mortar joints, using thin concrete and steel reinforcing rods. A gate opens to the generously proportioned motor court, off of which a door grants access to the home’s ground-level entrance. The billiards room, with a bar and open fireplace, beckons off the entry. A low, shadowed lobby introduces the interior of the main residence—a Wrightian device that prepares residents and guests for the dramatic burst of light and space awaiting atop the marble stairs. An elevated dining room with a massive fireplace serves as the centerpiece of the house. A soaring window is appointed with art-glass and facing windows feature mitered corners—another Wright signature to invite the outdoors into the house. High ceilings and numerous art-glass windows affording sprawling views of Los Angeles enhance the living room. 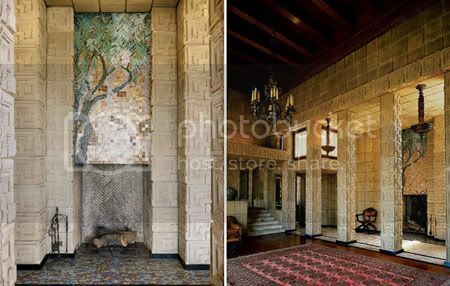 The glass-tile mosaic fireplace in the living room is one of only three ever created and the last remaining intact example in any Wright residence. A long window-lined loggia on the north side overlooks the pool and flows from the public rooms to the master suite, the guest bedroom suite, and a small Japanese garden. The kitchen and pantry are accessed through an elevated hall above the entry. A small bedroom with a bath is also included in this wing. A bridge leads from the main residence to the chauffeur’s quarters, which are located above the four-car garage. The chauffeur’s quarters comprise a bedroom, bath, kitchenette, and comfortable living area. Built for Charles W. and Mabel Ennis, the house was the largest of Wright’s four textile-block homes, as the Ennises liked to entertain. The residence has changed hands seven times since it was sold by Mabel Ennis in 1936, following Charles’s death in 1928. Various owners have contributed their individual imprints, but the original design has remained largely intact. 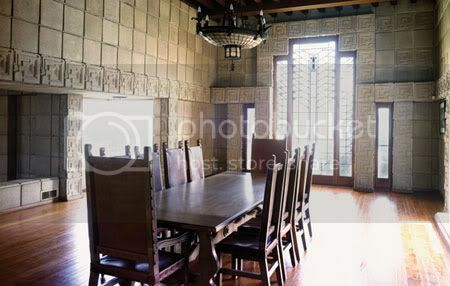 Unlike the other textile-block houses, interior details of the Ennis House, such as light fixtures, were not designed by Wright. 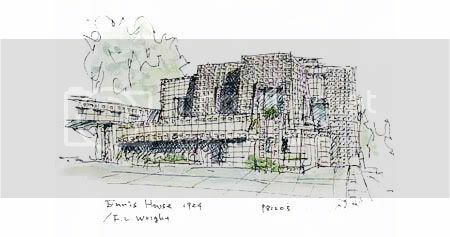 Wright’s relationship with Mrs. Ennis was strained and Wright left the project before completion. 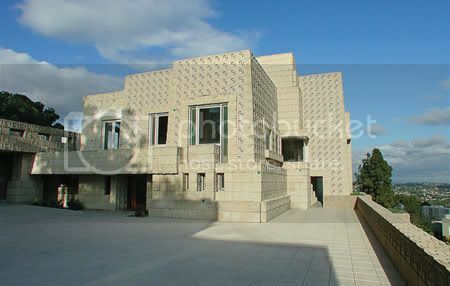 In 2009, the Ennis House Foundation has decided to place the Ennis House on the market for sale to a private owner with the vision and resources to give this house the level of care it needs and deserves.